Hey You! Sign up for VeganMoFo 2012! It’s less than two mere weeks away!!!!!! Here’s the sign up form. New to MoFo’ig? Want a refresher? Check out the updated F.A.Q. More tips & updates, the shiny new 2012 logo, and just perhaps, some 2011 VeganMoFo favorites, to follow soon! 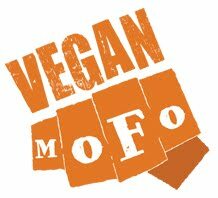 Seriously, start theme-storming and sign up for VeganMoFo, October 2012! We’d love to see you on the fancy blogroll. Banners and answering a few questions! I AM VEGAN… VEG SINCE AGE 7 AND VEGAN SINCE 21. I AM NOW 28. I’m not strictly vegan but definitely becoming cruelty-free, a major change from a lifetime of eating flesh and gorging on dairy. I’m also sort of new to blogging and don’t know what a pingback is. All that being said, there is plenty to talk about, losing my vegan virginity, finding vegan SHOES, life without real butter, telling my bowels that they can survive without daily animal protein, etc. I’m signing up but please make sure I’m hooked in since I’m still learning to navigate the blogosphere and the vegasphere. I know the clock is ticking, but I’ve spent HOURS on the techno part of all this. I’m on blogger. How do I make sure that I can be fed or feedread or readfeeded or whatever? I talked to some friends and dove into HELP more times than you can shake a stick at, but if you have time, I would love confirmation that I did what was required. Writing and taking photos are the easy part. Also, my blogger name is chowchowgrl but I don’t know if that appears as such but I want it to. Sorry to be pesty but this appeared at the last minute; I very much appreciate your time! Thank you, thank you, thank you! My link is fixed and now people can read my blog! You guys are the very best! Roll on, Vegan MoFo!